Should Fundraisers Drive Nice Cars? Like many American lads I truly entered adulthood after 30, an extended adolescence that included a run as a stagehand, nearly four wonderful years of grad school, and sailboat summers on Lake Monroe in Bloomington, Indiana. We don’t expect our boys to grow up quickly in America and I was no exception. In my 30s I learned to cook, to engage with women, to order from a wine list, to work a room, to gracefully accept victory and defeat. And to dress like a grown up. A suit for a man is almost always a winning proposition, and much simpler than attempting to appropriately match slacks and shirts. Put on a suit and no one is going to think you’ve overdone it. Add some French cuff shirts and you are ready for a formal occasion or an evening performance. Lose the tie at 6:30 and girls at the bar will give you the once over. Fun. I drive a 10-year old Toyota Matrix with 165,000+ miles. I haven’t had a monthly car payment in nearly 6 years – $400 or so in my pocket every single month. And beyond a few mid-sized repairs/maintenance all I pay for is gas and insurance. Is it a Nice Car? No. 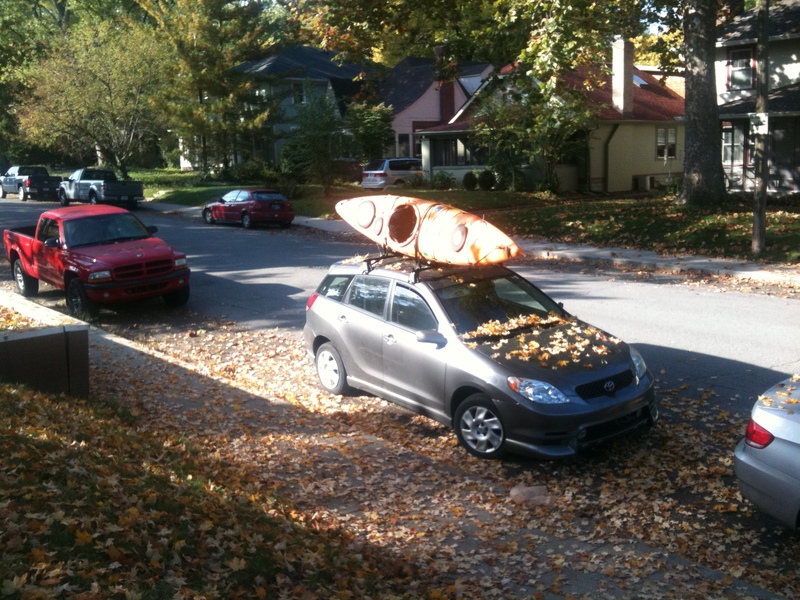 It is a boxy little machine, with inelegant lines and a kayak rack on the roof. Being 10 years old, it has big scratches, small dents, and the like. When people I know professionally see the car they often say, “I didn’t imagine you driving a car like this,” a polite nod to the disconnect of a non-profit executive in a good suit and an elderly Toyota. In my dating days the car was a Viability Test to women I’d meet, along with fish restaurants and foreign films. My thinking was that any woman who would judge me by my car wasn’t the girl to bring home to Mother. Should fundraisers drive nice cars? I have to say Yes. As a consultant I leave the good old Matrix in the airport garage so it does not impact my work these days but did it before? Perhaps. I was Head of Development for a new performing arts center a few years ago and it was a swanky undertaking. I was dressed for the part, with two tuxedos even, but my car always got quizzical looks. Those days were tumultuous and my plan was to buy a Grown Up car when things eventually settled down but they never did. There was a single week after our first fiscal closed with surpassed fundraising goal, a declared victory, and raises handed out by the boss. I started getting quotes on Audis. And then all hell broke loose once again. So no dice on a new ride. I always kept the car clean, having been given good advice that you should assume your boss might ride with you anytime. And I would give the occasional ride to a donor, apologizing to the small size and age of my beloved Toyota. The little old ladies would have the most awkward time climbing down into the seat and finding the belt and so. Once a donor even asked me, “Say, what are they paying you?” upon seeing my Toyota. Ouch. I make sizable (perhaps unfair) judgments based upon a man’s shoes and so it is reasonable to assume that I too have been summarily judged by my reliable, boxy, junky hatchback. Cars simply aren’t that important to me, the practicality of reliable, low cost transportation trumping the prestige of a shiny sedan. I’d rather book a trip to Argentina or kayak Monterrey Bay with dear friends. But like it or not, as a professional, the car means something to world of prospects, colleagues and the old ladies a fundraiser should be courting via your $5,000 lunch appointments. So should fundraisers drive nice cars? Yes, if we are truly projecting the brand and values of an organization. What are your values? You have bigger problems than a car if you are asking that question. Yes, if we are engaged in major gift work with high net worth, elderly individuals. Our donors need to see us and our good work, and offering them a ride is often the best way to get quality face time. Yes, if we are projecting success and inviting investment. Like it or not, we are competing with very wealthy organizations with deep pockets and highly paid gift officers. Mission counts of course, but so does the Messenger. You have face time with the Prospect today but tomorrow the Dean of the Business School is dropping by and he ain’t driving a beater. Our work as major gift fundraisers is much like a Realtor – we share opportunity, invite investment, and bring partners together. We don’t want anything standing in the way of this vital work of linkage and facilitation. Real estate people had this figured out long ago – if you are spending a sunny morning driving a couple around the suburbs looking at $250,000 houses you had best look sharp and drive even sharper. Those Mazda sedans are sure looking good. This entry was posted in Fundraising, Performing Arts. Bookmark the permalink. 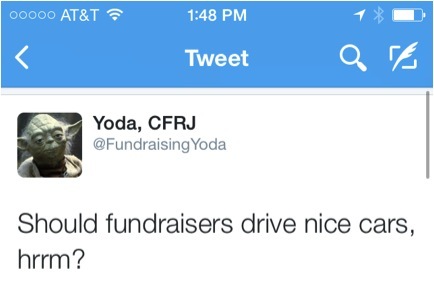 1 Response to Should Fundraisers Drive Nice Cars?